I am a Supervising Social Worker with a background in Child Protection and Looked After Children. I have worked extensively with children and families in crisis. The clear impact of early life trauma, separation and loss on children and young people has been of particular interest to me, and I have focused my training and development in this area. I am currently working for a Local Authority in a therapeutic fostering team. 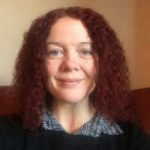 I am involved in direct work with foster carers and their children, and my work is informed by the principles of DDP, combined with Theraplay and an awareness of sensory processing needs.